That sounds pretty bad! Who knew that retrogaming could be so dangerous? 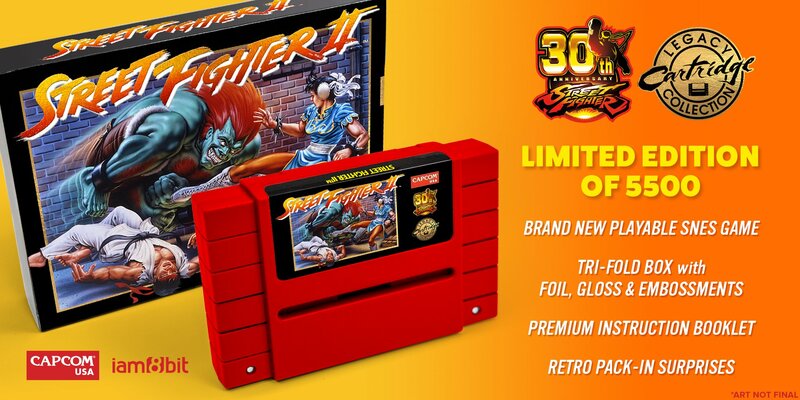 Since we do not know the exact internals of the new Street Fighter II cartridge yet, we can only speculate about the reasons for this warning. Or, heck, we could ask. Just yesterday, I sent iam8bit an email about this issue. I have not yet received a response (I will update this post when I hear something from them). While waiting to see if I ever hear back, I decided to consult some knowledgeable friends via the oracle known as Twitter. I received a quick response from Chris Covell, a respected video game tech enthusiast. Covell said, “As long as modern ‘professional’ retro publishers use 3.3V flash chips without good 5V level translation everywhere, yeah, there may be fire.” Although by email later, Covell said to replace the word “fire” in his tweet with “heat and/or magic smoke.” Not very reassuring, Chris. As I mentioned earlier, I don’t know what’s inside the iam8bit SFII cartridge, so we’re only speculating here. 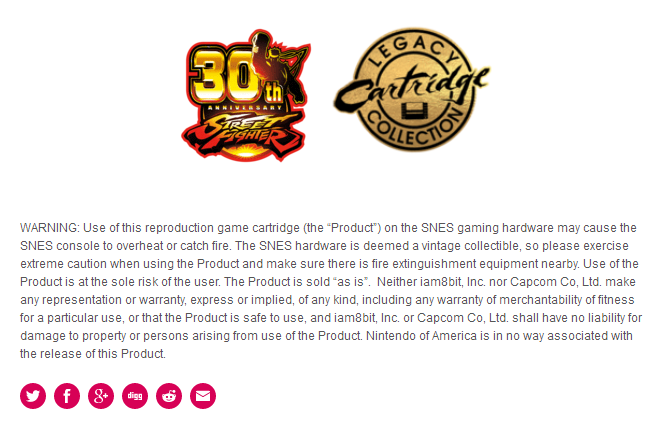 But when there’s a potential flaming Super Nintendo console involved, it’s for a good cause. In his Tweet, Covell pointed to a common problem with improper or missing level translation in flash or pirate video game cartridges. 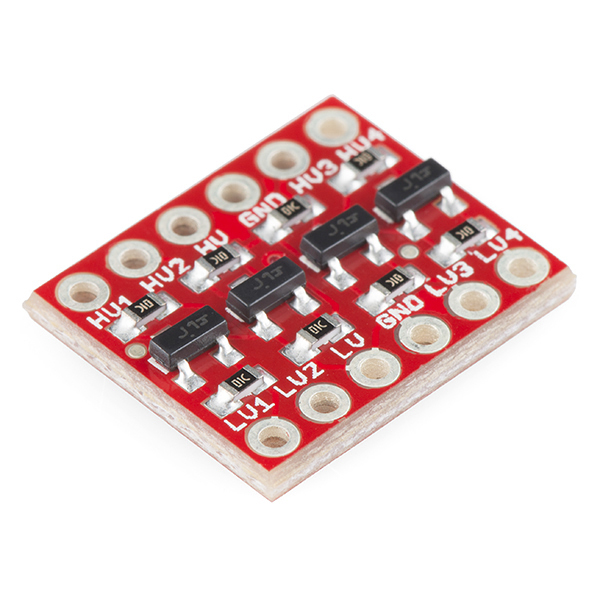 Level translation is a term that describes changing the voltage coming from a power supply to fit your needs using a small circuit (such as this product on SparkFun). It has been pretty well known for a while now that homebrew/pirate cartridges for retro systems made in recent years don’t contain the usual CMOS (5V) EPROMs, or even PROMs, but bog-standard modern flash chips that run on 3.3v. Some pirate carts built this way that don’t have proper level translation have actually failed on NES/Famicom systems, as reported in threads on NESDev. Kira Kira Star Night on FC, and other music carts have famously failed on actual NES/FC hardware. 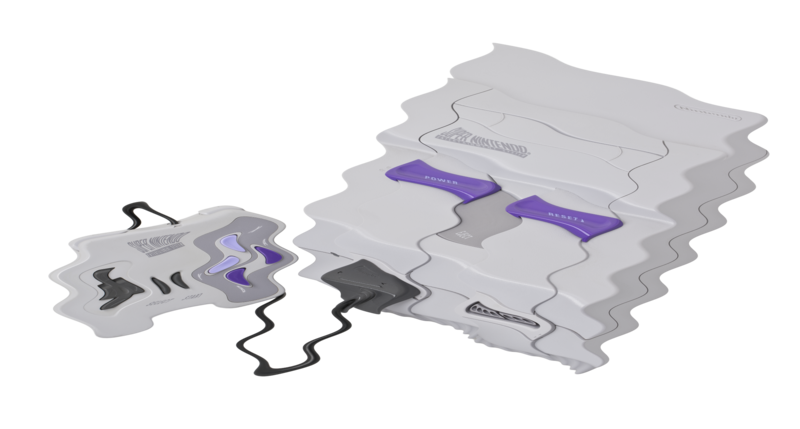 The Shubibinman Zero re-release did bad things to Jeremy Parish’s SNES, didn’t it? I don’t know about Jeremy Parish’s particular problem with Shubibinman Zero, but as Covell mentioned, there have been a few recent music game releases for the Famicom, and they have been problematic for certain Famicom/NES consoles out there. The level of heat involved might just melt the plastic or ruin the hardware, not burst into flames — and if that’s the case, then iam8bit is just covering all legal liability angles with their disclaimer. But man, why risk it? It’s sad that 5V chips are getting scarcer. It is merely “ROM” for now but it’ll mean that other chips (4-bit SRAMs & DRAMs, TTL logic ICs) may eventually be hard to come by for repairing old consoles & computers. Even with scarce parts, it is possible — almost trivial, if you know what you’re doing — to design a game cartridge that uses both 3.3V chips and incorporates level translation, thus completely avoiding any possibility of meltdown or fire. So in the end, what do we know? 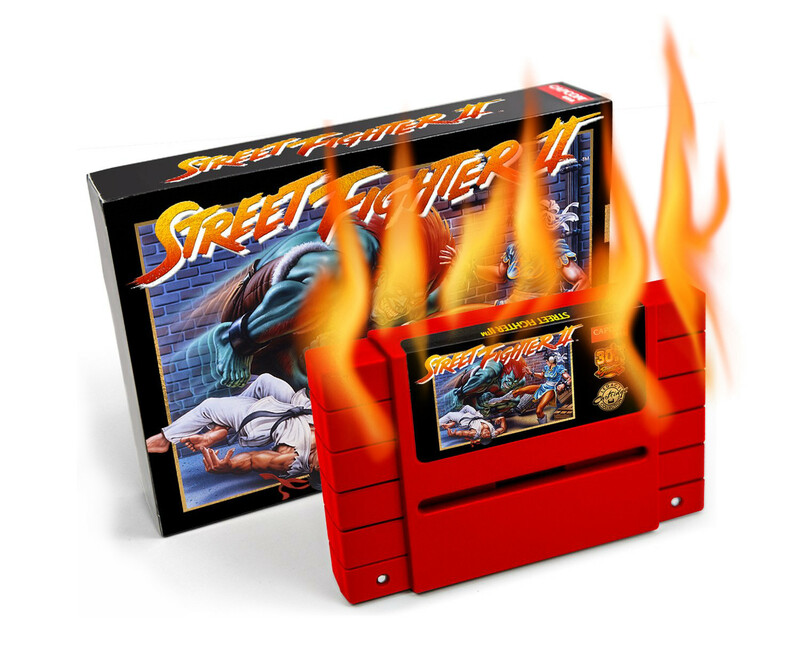 We know that even if your console doesn’t literally catch on fire from using this SFII release, you could either a) ruin the cartridge you paid $100 for, or b) ruin your console. Sounds like a pretty bad deal. I’m no philosophy major or consumer rights advocate, but it is not ethical to sell a product that might spontaneously catch on fire while you use it — especially if the manufacturer knows it might happen. Heck, it might even be illegal in some way. So stay far away from this one, folks. In fact, I recommend staying away from any of iam8bit’s products in general, because if a firm is willing to sell an openly defective product such as this SFII release, then it is liable to have much deeper ethical and business problems. They do have a few standing complaints against them that don’t inspire much confidence about their ability to deliver a good product, period. And what about Capcom? I hope they’re listening, because if I were them, I would pull their license to iam8bit quickly before they ruined their reputation with melting cartridges. This entry was posted on Friday, September 1st, 2017 at 9:52 am	and is filed under Collecting, Gaming History, Hacks & Projects, News & Current Events, Remakes & Reproductions, Retrogaming, Technology Commentary. You can follow any responses to this entry through the RSS 2.0 feed. You can skip to the end and leave a response. Pinging is currently not allowed. Not to get too nerdy, but a better question is why the heck didn’t they just add a 3.3V linear voltage regulator with thermal protection? Expensive ones cost pennies. Depending on Amps, you may not require a heatsink. All you’d need is a cap on either side of the regulator for clean power. I honestly couldn’t imagine someone laying out the board without considering input voltage. I’m still wondering who would actually buy this. SFII is super plentiful on the SNES. It sold over 6 million copies and I believe it was the best selling third party game on the SNES. I guess the pack-ins are ok, but not a $90 premium over the $10 you can find a copy of the original game.